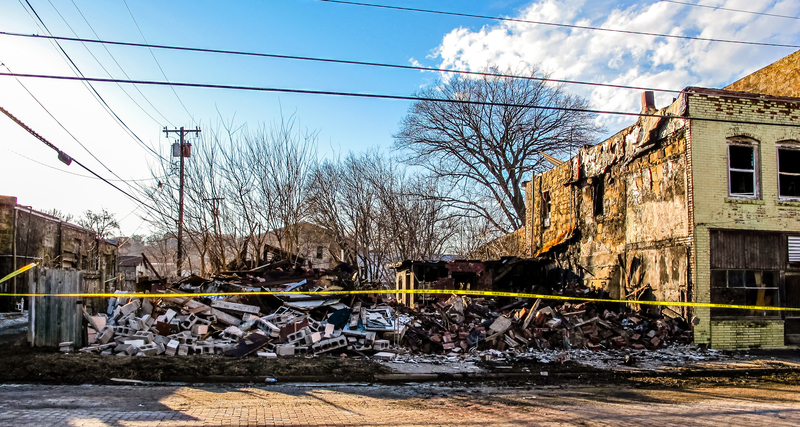 In the middle of February, a fire gutted a couple of buildings in downtown Barnsdall, Oklahoma. Oddly enough, this was not a surprise; I feel like a good chunk of my memories tied to that town are related to burning. I remember staying with my grandparents as a kid when the old church at the end of School Ave caught fire; the black smoke billowed into the sky to an impossible height. I remember when the Well’s Food Market burned to the ground and when the American Legion Hall succumbed to flame. While a fire in downtown Barnsdall was not a shock, I was shocked to see that the flames on the evening news were coming from my great-aunt Estelle’s former beauty salon. My family runs rich in Osage County, and Barnsdall is the hub for my mother’s side. I spent many weekends there with my grandparents, riding around in my Uncle David’s old Dodge and swimming in Birch Lake at family reunions. Mom grew up on those streets and was heartbroken when she heard about the fire. She had spent a lot of time at that salon with Estelle and next door at the Barnsdall Times print shop with her Uncle Marvin. I haven’t been very close to that side of my family in a long time, and as I drove to Barnsdall the day after that fire I reflected on the time I’d spent in that small town and time I’d lost to old grudges and tarnished relationships. Although the old salon had already been demolished by the time I arrived, the drive was good to help process my emotions and begin moving forward. Then, on March 3rd, something serendipitous happened. My friend Thom sent me a picture he’d taken in Barnsdall. He was familiar with my travels around the state and, in particular, a photo I’d taken of the old Bigheart Cafe sign in Barnsdall; it was a similar photo he shared. I was overjoyed that he and his wife had taken a few minutes to visit and asked what had taken them to such an out-of-the-way place. Thom excitedly told me they had just purchased two old letter presses from the former Barnsdall Times building, which had miraculously survived the fire, and they planned to restore them for their crafting workshop in Tulsa. These were the exact same presses my great-Uncle Marvin used for decades, and I couldn’t type fast enough to share this family connection with my friend. The fact that the presses survived extensive fire and water damage, coupled with this unknown family connection, stunned both of us. On March 27th, when Thom invited me to go with him to transport them, I tagged along with great joy. We arrived in town at about 8:00 the next morning. I didn’t fully appreciate the extent of the miraculous survival of the two printing presses until I saw the inside of the old print shop. The building had been neglected for decades, subjected to significant water damage before the fire happened. The bones of the structure were still intact, thanks to some solid stonework, but the insides were a cluttered mess. Chunks of insulation and old newspapers littered the floor as four of us (Thom, me, and two local fellas) figured out how to extract the 1,500 lb machines. In addition to the two presses I mentioned earlier, Thom and Christine were also going to see if they could restore a gigantic Kluge press that had once been used by the local paper. We cleared out a path to the back door so the fork truck could extend into the building to lift the presses out one at a time. As we worked, I was stunned at how the office appeared to just have been left as-is when it was shuttered thirty years ago. Old newspapers and small bits of lead type were strewn everywhere. 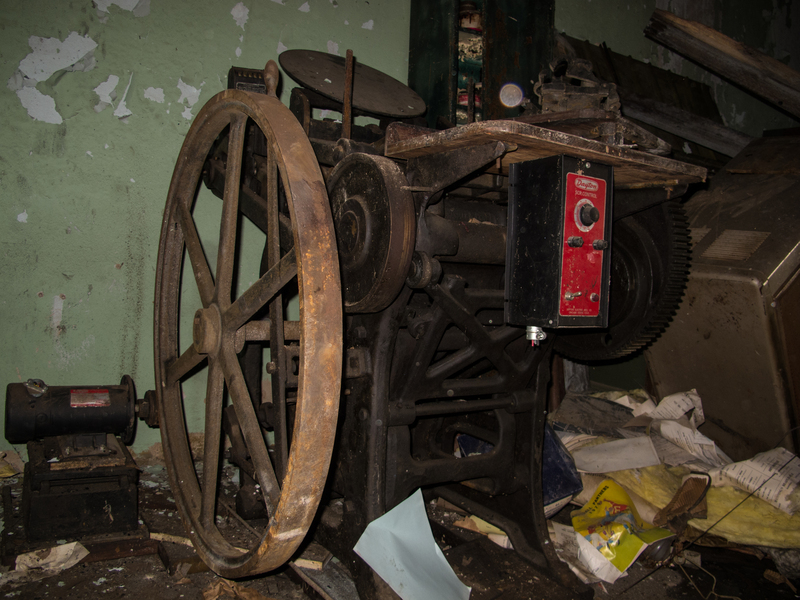 Many parts of the shop were inaccessible due to piles of furniture and other unidentified machine parts. There was even a smelter in the back that was used for melting down lead type so it could be recast. We finally loaded the Kluge press and began to bring it out when, disastrously, it shifted and slipped off the forks. Although it fell against a support beam, the damage was too great when coupled with the general fatigue of the old machine. It was essentially dragged out of the building and discarded. 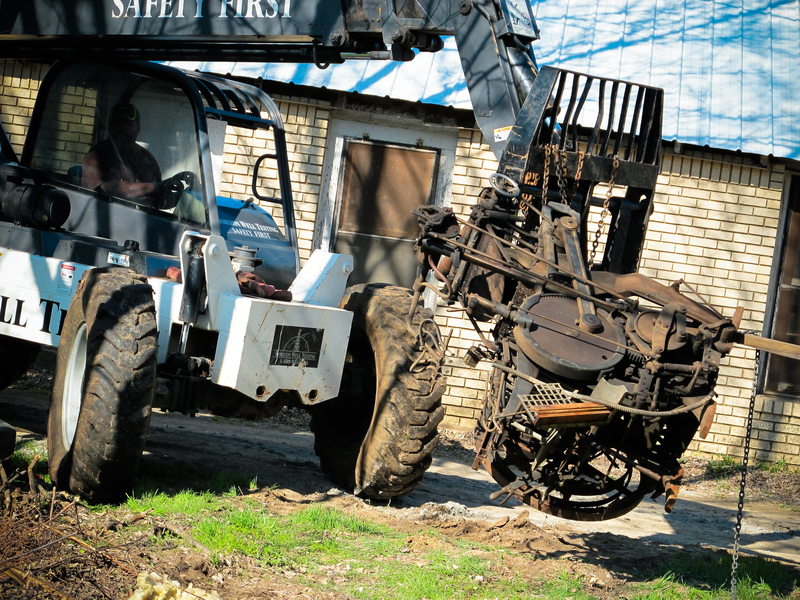 I was told that restoration of that particular machine had been in doubt anyway, but it was no less heartbreaking. A new game plan on the smaller presses resulted in success, and by 11:00 they were loaded onto a flatbed trailer, ready for transport to Tulsa. 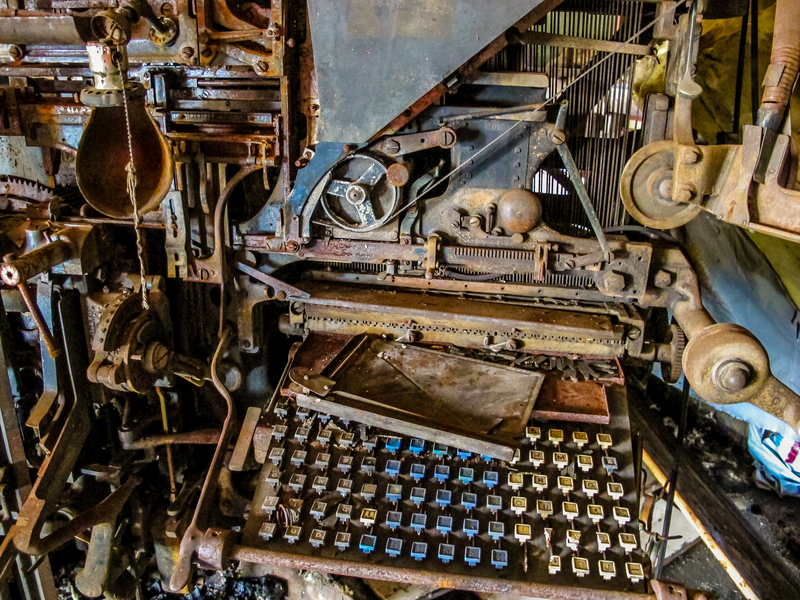 While everything was being finalized, I stood in the old print shop and admired the Linotype machines. Their rusted bodies looked like they had been dredged up from the deck of the Titanic and were sadly beyond repair. I visualized my mother telling me about these machines and her time here. She always closed her eyes when she talked about watching her Uncle Marvin type, smiling with happy reminiscence. I took a moment to introduce myself to the current owner of the newspaper, Louise, and shared my family connection with these antique machines. She lit up and asked if I’d be interested in a story in the Bigheart Times (the current iteration of the newspaper.) I told her that I’d love to, but that I wasn’t really the story. Mom’s story was WAY more interesting. A plan was hatched. Today, I met my mother to lunch and told her I wanted to take her by the Made Shop to see some of my work there and meet my friends, the owners. When we arrived, I surprised her by not only introducing her to Thom and Christine, but also the pair of letter presses from her childhood. Her jaw hit the floor and she was nearly overwhelmed with emotion as we told her how they had been saved and were now being restored to be used by a new generation. Louise had driven down, too, and Mom regaled her with the stories I’d heard about Uncle Marvin and the wonderful time she spent in that print shop. By the time we left, Mom was positively glowing. Many thanks to my friends Thom and Christine for including me in this event and Louise Redcorn for her generosity of time and interest in our little story. Seeing the smile on Mom’s face was a treasure of immeasurable value. This entry was posted in Oklahoma and tagged Barnsdall, oklahoma, osage county. Bookmark the permalink. U always have good stories!